(For anyone interested, the rest of the posting is found here). I would really like to submit an article about Isabella Stewart Gardner. She was a fine art collector in the 19th-early 20th centuries and opened a museum of her collection in 1903. Today, the museum remains essentially unchanged since Isabella’s death in 1924. There are many aspects to Mrs. Gardner’s life and collection that can be interpreted through a feminist lens. I think that the practice of art collecting is characteristically male, and it seems that Isabella also adopted (and perhaps flaunted?) some masculine characteristics aside from art collecting. She loved masculine sports like baseball and horseracing; the local newspapers were scandalized (and intrigued) by her behavior. Furthermore, Isabella’s appellate was also masculine; she was referred to as “Mrs. Jack” (“Jack” was her husband’s nickname). However, for all of the masculine characteristics that Isabella exhibited, I think that the display and maintenance of her art collection lends itself to feminist interpretation. Specifically, I would argue that Gardner’s museum (and consequently Isabella Stewart Gardner herself) resists outside control and change, which I think can be extended to a rejection of the controlling “male gaze.” (I have written a little more about the “male gaze” here). Isabella stipulated in her will that the museum needs to be permanently exhibited according her aesthetic vision. I think that because the museum remains unchanged, Gardner still remains part of the female “subject” that visitors see when they come to the museum. If her art collection was to be moved around and changed, Gardner would shift from being a powerful female “subject” to a female “object” – and consequently all of the paintings in the room would become “objects” instead of embodiments of Gardner and her aesthetic taste. Because of Isabella’s will stipulations, the museum has remained unchanged since her death. Even when several masterpieces were stolen (a loss that amounted between $300 and $500 million – the biggest art heist in history!) 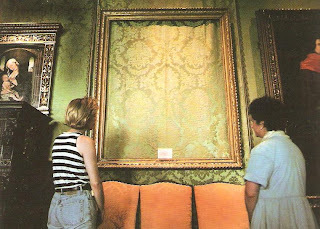 from the museum in 1990, the museum maintained the same display (with empty frames where the stolen paintings were once located). Today, these empty frames still remain, since the crime was never solved. (You can read a little more about the crime here). Even with these absent paintings, I think that the frames still function to represent the “subjecthood” and female control of Isabella Stewart Gardner. What do people think about female art collectors and Isabella Stewart Gardner? How would you respond to some of the questions put forth by the Women’s Studies Journal? very interesting…3 cheers for gardner and her vision! Interesting. Do you know what happens to artwork when it is stolen (generally speaking)? Since reading this I’ve been thinking about all the famous art heists I’ve seen on the news over the years … and now I wonder, where does this art go? Do you think it sold on the black market to private sellers? I think I’ll have to dedicate a post (or a couple of them!) to stolen art. Yeah, sometimes it goes to private collectors. Other times the art is held for ransom, exchanged as collateral for drugs, smuggling, etc. Once in a rare while, a thief will steal art because he actually likes the piece. One guy, a French waiter named Breitwieser, stole art that he particularly enjoyed. He stored the loot in his mom’s basement. When Breitwieser was discovered by the cops, his mom tried to protect him (or herself?) by destroying everything. She chopped up sixty oil paintings (including one by the famous artist Cranach) into tiny bits and threw them out with her kitchen garbage. She also threw another 100 objects into a canal. Pretty sad, huh? How devastating to the artist, their posterity, or even the world to have their work destroyed! Loved this post, Monica. I hope you’ll write that article and submit it. I look forward to more on stolen art, as well.